How are companies addressing lubricant storage and handling? Machinery Lubrication magazine asked readers to participate in its annual Lube Room Challenge by submitting exceptional lube rooms that incorporate best-practice features. Several readers met the challenge with evidence of how their lubricant storage and dispensing methods have been transformed. 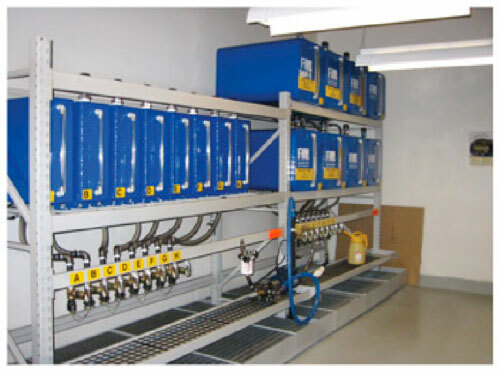 These examples showcase how designing a proper lube room is one of the first steps to achieving lubrication excellence. How do I make sure my lube room complies with fire safety regulations? Being in compliance with fire safety regulations presents a challenge to lube room maintenance engineers. Keeping your employees and equipment safe and complying with strict insurance regulations requires a solution that will enable you to do both. One solution is a fire safety kit. The kit replaces the standard PVC sight gauge on the front of the containers in a typical IFH storage & dispensing system with a fire-resistant glass sight gauge equipped with ball check fittings at both ends to prevent any product spillage if the glass should break. Underneath the containers, the standard PVC hose is replaced with a steel hose that connects to a fusible link valve with a spring-activated handle. If the temperature reaches 165º F (73.9º C), the handle is automatically triggered and shuts off any possible leakage of fluid from the container. The fire safety kit can be supplied with new IFH storage and dispensing systems or as a retrofit to existing systems. It provides a ready-made solution for customers who need to be in compliance with stricter fire safety regulations. 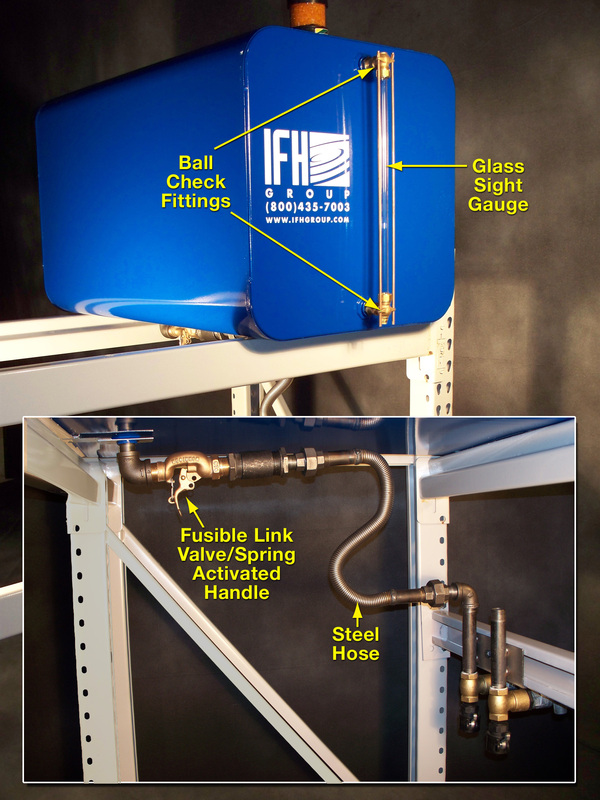 What lubricating fluids can be stored in an IFH storage & dispensing system? IFH systems can handle lubricating fluids used throughout your manufacturing plant. These include gear lubricants, greases, cutting oils, bearing oils, hydraulic fluids and engine oils, as well as specialty fluids like anti-freeze, automatic transmission fluid, 90-140 heavy gear oil, airline oil, and many others. Each container in the system can hold 65 gallons of fluid. Larger containers are available on special order. The most inexpensive method of increasing capacity of frequently used products is to “wed” two or three containers together, and plumb to one spigot at the filling console. Can “Food Grade” lubricants be stored in the system? IFH Systems are currently being used at many food manufacturing facilities in the US and Canada. The normal modification is composed of dedicated transfer systems for each “Food Grade” lubricant and a stainless steel container. Are there products that cannot be stored in an IFH System? Yes…products with a flashpoint below 150°F (65°C), or products with a PH below 3. Storing unapproved products can result in operator injury, destruction of the system, contamination of products, and void of warranty.